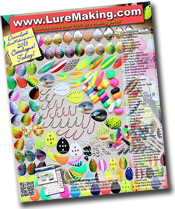 LureMaking.com's Magnum lure bodies are extra large and designed for your largest, meanest musky, pike, and big fish spinners. "W" is similar to the tapered "V" but with a larger in diameter than the tapered "V" lure body. Item Code Style Weight Approx. * Style "X" body is no longer only available! * Style "Y" body is no longer available ! * Style "Z" body is available in Nickel! We are discontinuing the following Magnum Brass bodies. Style X, Y, Z, and CC. Available while quantities last.